The UK hung parliament is hanging sterling out to dry. After a disastrous past 2 years it looks like the ‘fun’ is just beginning for the British pound sterling. Support is now giving way to the next wave in a long term decline that has been underway for decades. Soon it will be £1 for $1, and the inhabitants of the UK won’t be going on holiday anywhere outside of the British Isles. It will all be blamed on Brexit, without realizing that the Euro is going right down with it. Global debt – now at a mind-spinning $175 trillion is almost all priced in dollars. As the dollar rises, the debt becomes unserviceable. Stand well back people. When this one explodes we are literally heading into a world of pain. The liberal left, where the SJWs and feminists roam, have decided that Trump has ignited their ire because his political identity reveals he cannot be pushed around by them the way Obama was. Pushed around, that is, by the SJW/Feminist political element which functions as the moral cover for the American Deep State, yet brings howls and shrieks from the liberal left who liken him to Hitler and call him misogynistic and xenophobic. The irony has never been richer. The Peace and Love/SJW brigade stood firmly behind the destruction Syria… and the 400,000 deaths that rest on its shoulders. Indeed, the left, who claims to not be xenophobic, has a xenophobia all of its own:Russo-phobia. But that, naturally, does not ‘count’ politically, because Russians are white. The Deep State has set the pieces of the American chess board perfectly. The left can claim that it is Trump who is a fascist, while their calls for violence, assassination and actual violent conduct are considered the clambouring of ‘freedom’ and open mindedness. The American left is now begging for a communist-style revolution. They criticize none of the neocon actions in the middle east, the infinite unsustainable debts and deficits which will destroy America shortly or Obama dreadful healthcare policies… or the corruption of the Clintons. 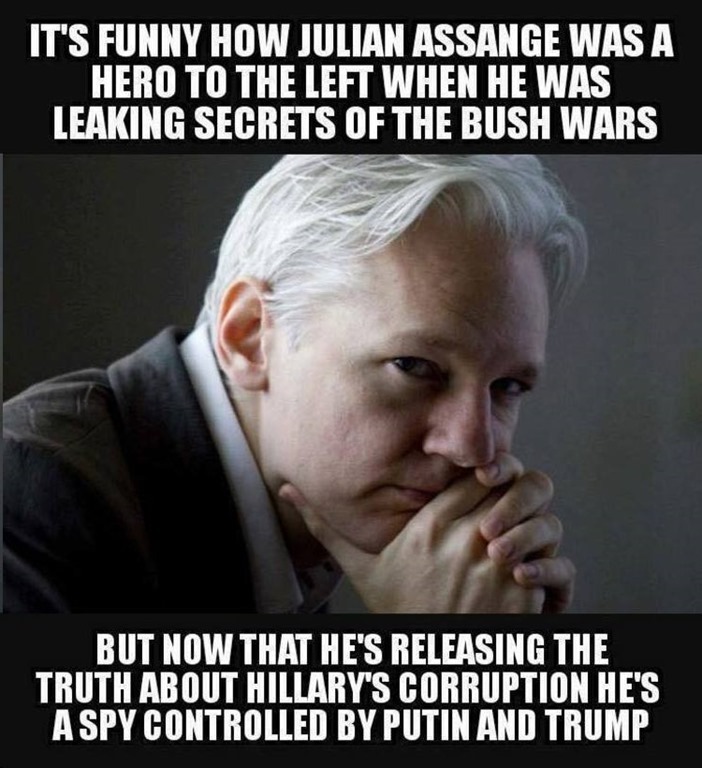 The liberal left has been played by the Deep State neocons perfectly. They must be hysterical with laughter at how easy it is to lead them around by the nose. And, most importantly, they have set them up to be champions for the war with Russia that they so desire. The left has even bought the “Trump as Manchurian Candidate” meme… which could only be constructed and floated by those who wish to fulfill the final neocon objective: a war with Russia. So, the SJW/feminist ire at Trump calling a woman fat, and revealing that some women seem to be willing to allow sexually abusive behaviour, as long as the abuser is rich and famous, will raise their moral indignation to the point of nuclear confrontation with Russia. What a nice balanced approach. When and if they finally kill Trump for attempting Detente, remember who sanctioned it; remember who politically greased the wheels in the popular mind to accept it… as you run for the besieged airport to try and get out of the northern hemisphere… and the mushroom cloud on the horizon closes out you, your families’ and your nations’ lives at 20,000 degrees centigrade. … but it will all be worth it. After all… Trump said a bad word about women. As predicted here so many times, the Euro is now heading for collapse. Technical support has given way and the currency is being sold at an alarming rate as the debt markets turn and people rush for safety into US Dollars. There is little to support the Euro now until we get to .87 vs. the dollar. The EU dream is over. Its would be best if the politicians unwound it now sensibly, instead of fighting the losing battle to keep it going and destroying the entire European economy along with it. Where is the female “representation” here? “Five men have died after a “large concrete structure containing metal” collapsed at Hawkeswood Metal recycling plant. Paramedics tried to free the men, including one who had suffered a heart attack. But West Midlands Police pronounced all five victims dead at the scene of the industrial accident in the Nechells area of Birmingham.